Note: In taking the numbers from my table and writing them as prose in the book, I inadvertently made an error in footnote 24 on page 301. The sentence “Among those with a high school degree or less, it rose from 64.1, to 64.6, to 72.9 over that period” should instead read “Among those with a high school degree or less, it fell from 72.9, to 64.6, to 64.1 over that period.” My apologies for the error. The analysis in the main text, however, remains correct. 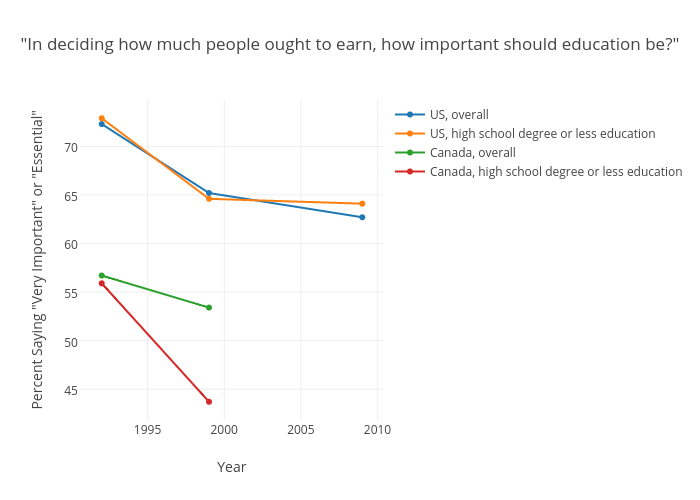 (As I write on pages 171–72, “the less educated are equally or slightly more supportive [than the more educated are] of the view that education ought to matter in deciding pay,” a relationship that accurately represents the data above.) Click on the chart for the data and an interactive display.